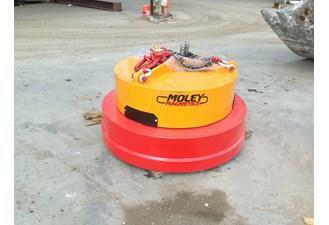 Casey-Bertram is excited to announce the newest piece of processing equipment – Moley Magnets ESA 50. In today’s demolition industry, it is important for a company to be efficient in all facets while on a jobsite. Casey-Bertram has taken another step forward in becoming more efficient by adding an electromagnet to its processing equipment. Retrieving every piece of scrap metal possible from a jobsite means more savings for our customers and less trash in the landfills. In the past we would use laborers to sort through the debris piles to separate the scrap metal from the trash. This was all done by hand, which is very labor intensive. Since obtaining the new magnet, we are able to spread the debris pile thinly across the ground and sweep the magnet over top, picking up scrap metal in a matter of seconds, rather than hours. 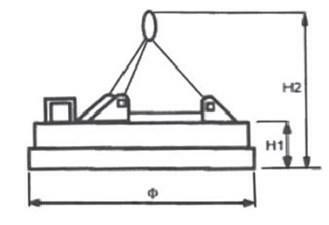 The Moley-Magnet ESA 50 is a fully enclosed hydraulic magnet. This magnet is ideal for demolition, because it fits easily onto existing equipment and is rugged enough to take the constant beating of being on a demolition jobsite. Time is money! Available in multiple sizes and can easily lift 1500+ lbs.